The goal when building a model railroad should always be to make the scene appear as realistic as possible. Naturally, if your layout is modeled after an area with paved roads and homes with electricity, there are bound to be other signs of modern life–most notable among them telephone poles and lines. 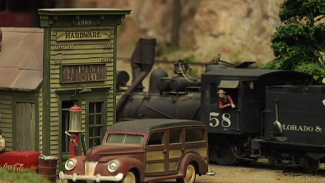 Some modelers tend to shy away from using delicate model train parts such as telephone poles and lines because they think they’re too easily breakable, but these small details can add an amazing amount of realism to your scenes. So in this lesson, we teach you expert techniques for working with those more fragile model train parts to really give your layouts that extra boost of reality. The most important thing when working with smaller model train parts is to handle them with care. You shouldn’t rush as you prepare and apply delicate model train parts to your scenes, the glue doesn’t dry that quickly. To demonstrate the proper way to work quickly but carefully with fragile model train parts, NMRA Master Modeler Gerry Leone teaches you how to add telephone poles to your layout and then string the lines between them. Gerry begins the step-by-step process for making these impressive model train parts by showing you how to score and paint your telephone poles with a razor saw and a dry brush technique. Once you’ve given the poles a nice flat coat, you’ll learn how to plant them into your scene at the appropriate distance and height. To get the current running, you’ll need to string up some power lines. 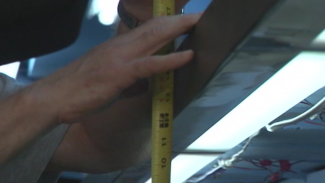 Model railroad supply companies such as Birkshire Junction sell elastic lines in a variety of colors that are perfect for simulating cables, and Gerry shows you how to add these model train parts to your scene using canopy glue and a toothpick. 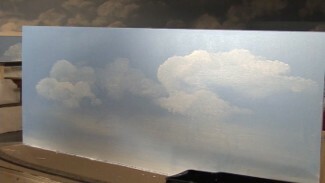 You’ll see that, with Gerry’s expert techniques, the process for working with delicate model train parts really isn’t so scary, and it does wonders for giving your layouts a whole new dimension of realism!